The ground is slipping from under the houses of nearly 200,000 people. Houses are sinking into cavities, some 15 metres deep, left behind by the abandoned mines of Western Coalfield Limited (wcl). 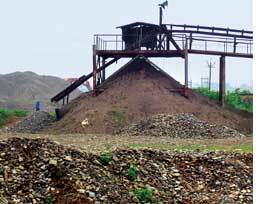 The mines are located under a six-kilometre stretch in Maharashtra's Chandrapur town. As houses caved in and cracks appeared on walls, wcl urged residents, most of them former workers, to move to somewhere safer. But there is nowhere they can go. Nor does the public sector undertaking have any plans to relocate the people living so dangerously. On August 15, two houses in the Lalpeth area collapsed into a 15-metre cavity. Nine neighbouring houses developed cracks. Residents said they received a notice to clear out of the area four days before this subsidence.Forty families were evacuated on the night of August 14, hours before the cave-in. They were hastily put up in abandoned staff quarters, most of which had doors, windows and even roofs missing. 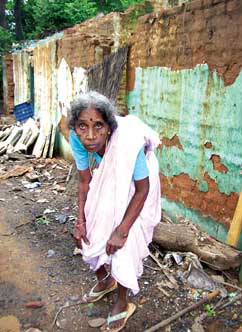 The house where Palla Mallesh Kumar took refuge with his ailing wife and disabled son did not have a roof. 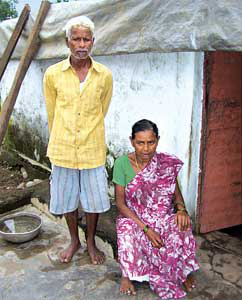 Kumar retired from wcl as a labourer; his was one of the two houses that caved in on August 15. "Three generations of my family have worked for wcl. The British gave us this land so we could build a house. Now we are being told to clear out without any kind of relocation plan. Where can we go?" he asked. Residents Down To Earth (dte) spoke to alleged wcl asked them to leave the area. The company paid no heed to their rehabilitation pleas, they said. When the British began excavating for the mines in the 1920s they resettled the bulk of their labour force from Andhra Pradesh. After the mines were nationalized following Independence, they continued to work in the mines, now taken over by wcl. Today the area has grown into a crowded jumble of slums and low cost housing for the poor. Reena Ramteke, whose house developed a deep crack, was among those evacuated in August. The house she and her newborn baby were moved to along with the family had no roof. So they moved back to their own house and fear that it could collapse anytime. "How can we live in a house pouring with rain?" asked an angry Ramteke. Like her most of the 40 evacuated families have returned to the houses damaged by the recent subsidence. The subsidence occurred after outlets were blocked for the rainwater accumulated in the ditches left behind by the mines. The water flowed under the houses causing the ground under them to sink. "We had pleaded with the manager not to block the outlets, but he did not listen," said the elderly Mallubai Rasawar whose house has huge cracks. The August 15 subsidence is the most recent in a series of similar cave-ins over the past few years in the six-km stretch from Lalpeth to Bengali Camp, under which the mines are located. Suresh Chopne of Green Earth Foundation, an ngo working in the area, said subsidence occurred because the reclamation work was substandard. The mines were located in sedimentary rocks; concrete pillars were needed to prevent them from caving in. "But the wcl provides only wooden support and natural pillars, which are clearly inadequate protection," he said. The foundation has been running a sustained campaign against wcl's underground mine reclamation work in Chandrapur district because it is "unsafe". Chopne also alleged corruption in the reclamation of closed mines. Once a mine is closed it has to be tightly packed with sand. "Contractors, hired to fill up the mines, bribe wcl officials and the mines are either half filled or not at all," said Chopne. Not just that. "Closed mines also continue to operate illegally, which makes them dangerous." wcl brought in a new manager, R S Gupta, after the earlier manager was transferred following the August 15 subsidence. Gupta told dte, "The Lalpeth mine is not closed, there is no question of proper reclamation." But this correspondent saw filling work was going on in the mine. A group of residents she spoke to said it is never clear what goes on in the mines.